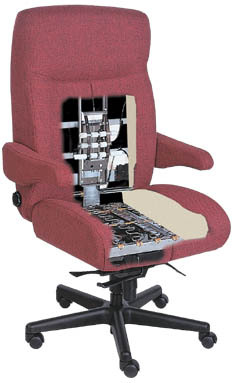 A concept unheard of in an office chair... until now. Built to demanding specifications set by the auto industry which require occupants to be comfortable over extended periods of time... 14, 16, 18 hours or more. Heavy duty 14 gauge steel construction cradles your body with support and comfort. As used in the worlds finest automobiles. At last! A lumbar support that adjusts up and down as well as forward and backward to best fit your shape. Fully supports flat, average or deep spinal curves. "No-sag" sinuous springs are used to relieve pressure from your legs, spinal column, shoulders and neck. Gently slopes away from the area behind your knees. Allows for improved blood circulation. Promotes correct seating posture and allows the chair to fully support your spinal column, pelvis, legs, shoulders and neck. Adds up to 2.5" seat depth. These PDF downloads require Adobe Reader to be viewed on Windows. Mac OS X users can use Preview.app to view them.